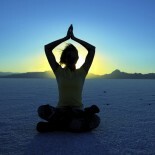 There are some excellent sites that have a wonderful variety of guided meditations. 7 minute long slow breath – This short guided meditation is something that you can do before you go to sleep each day and when you wake up in the morning. After listening to this several times, please create your own meditation with the instructions that are most helpful to you. Detail Instructions with long Slow Breath – This guided meditation has some techniques that can help improve your ability to focus.